Ad tech provider MediaMath is forging strongly into programmatic video and connected TV, by among other things joining the board of the IAB Digital Video Center of Excellence, and seeking to help drive transparency and industry standards. SpotX and Tru Optik have announced a partnership that enables video content providers to pre-segment and validate their ad inventory, so that buyers are able to create targeted, audience-based connected TV and OTT ad campaigns. Under the partnership, SpotX’s Audience Management Engine has been integrated with Tru Optik’s OTT Data Marketplace. In addition, advertisers and content providers will gain access to Tru Optik’s Cross Screen Audience Validation (CAV), which provides deduped household reach, frequency, in-target percentage rates, device delivery confirmation and reporting. More evidence of the boom in connected TV ads: AppNexus reported advertising spend in its connected TV marketplace grew by 748% in Q2 ’18 vs. Q2 ’17, with sequential growth of 69% in Q2 ’18 vs. Q1 ’18. AppNexus said it sees over 20 billion monthly CTV impressions on smart TVs, set-top boxes and game consoles, which underscores the rapid adoption of ad-supported video on CTV. At our recent VideoNuze Online Video Ad Summit, the “Video’s Programmatic Roadmap” session explored how programmatic is becoming more mainstream in premium video, why connected TV is a huge growth area, how brand safety and viewability are being ensured, the various ways data is being used by both advertisers and publishers, plus lots more. Participating on the session were Melissa Bonnick (SVP, Programmatic Strategy, Affiperf/Havas), Eric Hoffert (SVP, Video Technology, AppNexus), Sean Holzman (Chief Digital Revenue Officer, Bonnier), Keren Katz (Head of Bidder and Buyer Development, Programmatic, Microsoft), with Brian Leder (Partner, Chief Strategy Officer, Promatica Consulting), moderating. At our recent SHIFT // Programmatic Video & TV Ad Summit, we had a great session focused on how devices and distribution are contributing to advertising paying off in new ways. Topics included how to improve audience targeting, creating value in a multi-touch world, how to unify analytics across all distribution points, why more premium content is flowing through connected TV devices, the role of ad ops and yield management, plus lots more. Panelists included Youssef Ben-Youssef (Head of Ad Platform, Roku), Stephen Bach (SVP, Partnerships and Business Development, Vemba), Keith Grossman, Global Chief Revenue Officer, Bloomberg Media Group), Anthony Laurenzo (SVP, Non-Linear Video Strategy & Investment, Amplifi), with Tim Hanlon (Founder and CEO, The Vertere Group) moderating. Our morning keynote interview at the SHIFT // Programmatic Video & TV Ad Summit was with Jon Stimmel, Chief Investment Officer, Universal McCann. Jon was interviewed by Matt Spiegel, Managing Director, Marketing and Technology Solutions, MediaLink about a range of topics including unified measurement, data fragmentation, changes to UM’s planning and investment process, integrated buying, CMOs’ outcome targets and much more. Panelists included Paul Bannister (EVP, CaféMedia), Dvir Doron (CMO/BDO, Cedato), Joe Lospalluto (Head of Sales, Americas, Smart), Chip Schenck (VP of Audience and Programmatic Solutions, Meredith), Frank Sinton (President and Founder, Beachfront Media) with Brian Ring (Principal Analyst, Ring Digital LLC) who moderated. One of the highlights of last week’s SHIFT // Programmatic Video & TV Ad Summit was a joint presentation from Brightcove (Mike Green, VP, Marketing and Business Development, Media), SpotX (Kevin Schaum, Sr. Director, Mobile and Connected TV) and the IAB Tech Lab (Amit Shetty, Sr. Director, Video & Audio Products) on how server side ad insertion (SSAI) adds value to programmatic for both linear and on-demand advertising. For those not familiar with SSAI (also known as “ad stitching”), this is a process for inserting ads into a piece of content (frequently long-form). There are multiple benefits of SSAI including better user experiences, reduced buffering, extended device reach, elimination of ad blocking and lower cost of deployment. Mike, Kevin and Amit elaborated on how these benefits are even more valuable for programmatic, especially in live and in skinny bundles, while also noting some of the key outstanding challenges. 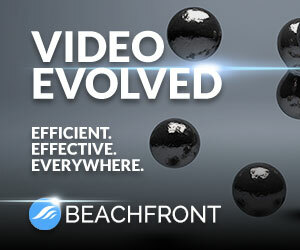 The presentation clearly communicated how the industry needs to work together to evolve video advertising given new viewer behaviors, device proliferation and publishers’ pressures to fully monetize. At last week’s SHIFT // Programmatic Video & TV Ad Summit, Lauren Fisher, eMarketer’s principal analyst, kicked off the day sharing her forecasts for both programmatic video and programmatic TV ad spending in the U.S. Following her presentation, I interviewed Lauren and the audience asked a number of questions. Overall, Lauren sees strong growth ahead for programmatic video, which will account for 76.5%, or over $13.4 billion of online video advertising by 2019. She’s particularly bullish about the role of mobile, which she sees growing to 60% of programmatic video by 2019. Lauren is also optimistic about connected TV’s opportunity, though she still see it as early in its development. Programmatic TV is not nearly as far along, with Lauren forecasting $3.8 billion in spending by 2019, representing 5% of overall TV ad spending. Lauren also reduced her 2018 forecast to $2 billion, which is roughly half of what she forecast for 2018 when she presented at SHIFT 2016. We discuss all the reasons behind her revisions. No surprise, at last week’s SHIFT // Programmatic Video & TV Ad Summit, the “duopoly” of Google and Facebook came up repeatedly on stage, mainly in the context of how they’re pursuing TV ad dollars and what the TV industry is doing to defend itself. In fact, the whole concept of “programmatic TV” - TV networks data-enabling and automating /streamlining the ad transaction process - pretty much captures what the industry is doing to become more competitive. But as I listened to and participated in the SHIFT sessions, one consideration kept coming back to me as possibly being the biggest single influence over how TV advertising evolves in the coming years: the idea that Google and Facebook are single entities, while the TV industry is fragmented with many different powerful players, each with their own agendas, capabilities and resources. I’m pleased to present the 397th edition of the VideoNuze podcast with my weekly partner Colin Dixon of nScreenMedia. Many thanks to Brightcove, this week’s podcast sponsor. This past Wednesday was our 3rd annual SHIFT // Programmatic Video & TV Ad Summit in NYC. There were so many great insights shared by speakers and in today’s podcast, I highlight (and we discuss) 4 main themes that recurred throughout the day. Taken together, the themes reveal just how significant the challenges are that the ad-supported TV industry now faces. Changes in viewer behavior, ad buyer expectations, competitive forces and technology have created what a number of speakers characterized as an “existential threat” to ad-supported TV’s future. As Colin and I discuss, there are no silver bullets that neatly address these challenges. The industry is trying a lot of different things, but it’s not clear yet what these efforts will add up to. Join over 350 industry colleagues at our 3rd annual SHIFT // Programmatic Video & TV Ad Summit, tomorrow, Wednesday, November 29th in NYC. Over 40 industry leaders will be speaking on 11 sessions, including A+E Networks, Amplifi, Bloomberg Media, Discovery, eMarketer, Fox Networks, Meredith, National Geographic, Publicis Media, Roku, Time, Turner, Vevo, Viacom, plus many others. 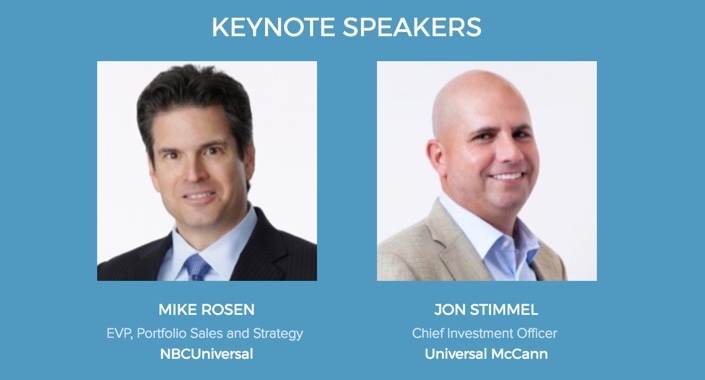 Our 2 amazing keynote guests are Mike Rosen, EVP, Portfolio Sales & Strategy, NBCUniversal, who will be interviewed by Matt Prohaska from Prohaska Consulting and Jon Stimmel, Chief Investment Officer, Universal McCann, who will be interviewed by Matt Spiegel, Managing Director, MediaLink. Overall, SHIFT promises to be a premier day of learning and networking. All paid registrants are entered to win 1 of 3 Roku Ultra 4K players. Perfect for yourself or for a stocking stuffer gift this holiday season. Many thanks to our 14 generous sponsors including Title Partner FreeWheel; Premier Partners SpotX, VertaMedia and Videology; Headline Partners 4C Insights, Beachfront Media, Brightcove, Cadent, Cedato, SintecMedia, Smart AdServer, Vemba; and Branding Partners Gotham Ads and Roku. Two weeks from today will be our 3rd annual SHIFT // Programmatic Video & TV Advertising Summit on November 29th in NYC. The program is locked in with 40 amazing speakers who will be featured in keynotes, research presentations, fireside chats and panel discussions throughout the day. Kicking things off will be Lauren Fisher, Principal Analyst at eMarketer, who will share details behind her forecast that programmatic video & TV will exceed $17 billion by 2019. Our morning keynote interview is with Mike Rosen, EVP, Portfolio Sales and Strategy, NBCUniversal and the afternoon keynote interview is with Jon Stimmel, Chief Investment Officer, Universal McCann. In addition, Dan Aversano, SVP, Ad Innovation and Programmatic Solutions at Turner Ad Sales will be featured in an afternoon spotlight fireside chat. A reminder that all SHIFT paid attendees will be entered to win 1 of 3 Roku Ultra 4K players, generously provided by Roku. Additional discounts are available on 5-packs and 10-packs. And, startups and students can register for the reduced $245 ticket (contact me for the code). As always, there will be abundant networking opportunities with speakers and attendees at SHIFT. Please join us for what will be the highest-impact day of learning and networking around programmatic video & TV of 2017. Today’s the last day for early bird discounted tickets for the SHIFT // 2017 Programmatic Video & TV Advertising Summit on Wednesday, November 29th in NYC. Early bird registration saves you $100 and also doubles your chances* of winning 1 of 3 Roku Ultra 4K players, generously provided by Roku. Additional discounts are available on 5-packs and 10-packs. And, startups and students can register for the reduced $245 ticket (contact me for the code). SHIFT is going to be a jam-packed day of learning and networking with 30+ industry executives on a dozen different sessions. Attendees will hear from companies leading the charge into programmatic video and TV including 4C Insights, A+E Networks, Amplifi, Beachfront Media, Bloomberg Media Group, Brightcove, Cedato, Cross MediaWorks, eMarketer, FreeWheel, Fox Networks Group, IAB, IBM Watson, MediaLink, Prohaska Consulting, Publicis, Roku, SintecMedia, SpotX, Time, Inc., Turner Ad Sales, Vemba, VertaMedia, Vevo, Viacom, Videology and others. I hope you’ll join us for this must-attend day of learning and networking! Early bird discounted tickets end on Friday for the SHIFT // 2017 Programmatic Video & TV Advertising Summit on Wednesday, November 29th in NYC. 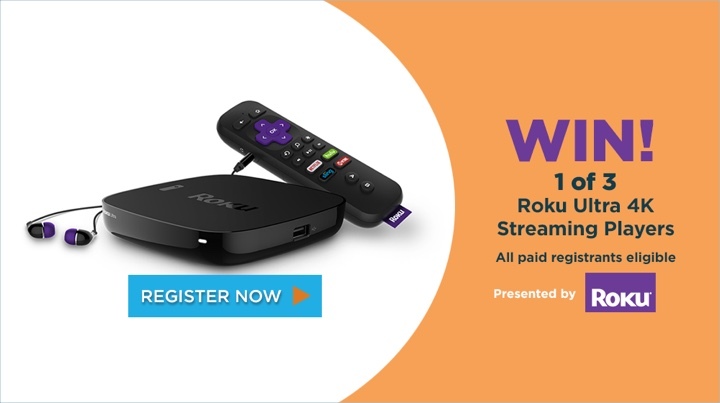 If you register early you save $100 and also double your chances* of winning 1 of 3 Roku Ultra 4K players, generously provided by Roku. Additional discounts are available on 5-packs and 10-packs. Startups and students can register for the reduced $245 ticket (contact me for the code). SHIFT is going to be a jam-packed day of learning and networking with 30+ industry executives on a dozen different sessions. Attendees will hear from companies leading the charge into programmatic video and TV including 4C Insights, A+E Networks, Amplifi, Beachfront Media, Bloomberg Media Group, Brightcove, Cedato, Cross MediaWorks, eMarketer, FreeWheel, Fox Networks Group, IAB, IBM Watson, MediaLink, Prohaska Consulting, Publicis, Roku, SintecMedia, SpotX, Time, Inc., Turner Ad Sales, Vemba, VertaMedia, Vevo, Videology and others. Our amazing keynoters are Mike Rosen, EVP, Portfolio Sales and Strategy, NBCUniversal and Jon Stimmel, Chief Investment Officer, Universal McCann.